Now more than ever it is paramount for us all to keep in mind what is important … coming together. As we come to the end of an ever trying presidential election we embark on the quickly approaching holiday season. Now more than ever it is paramount for us all to keep in mind what is important … coming together. There is no better way to leave our worries behind than spending time with family and friends and surrounding ourselves with love. Thanksgiving and Christmas gatherings become much more special when we create a beautiful setting for all to enjoy. 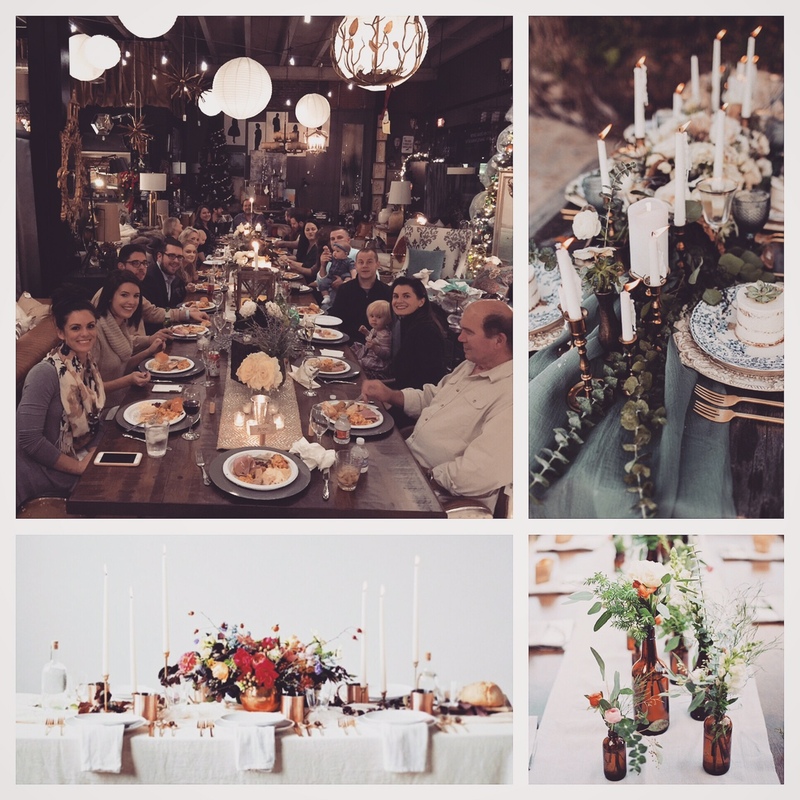 Constructing a cozy and inviting tablescape is simple when you follow these general guidelines! Layers, layers, layers. Like any great design, layering elements is the key to an attractive tablescape. Think of it as a cityscape – the varying heights add visual interest to the scene. Use assorted sizes, shapes, and textures to add depth and dimension to your arrangement. The tallest piece should be your focal point and this can be anything from a vase of flowers to mini terrariums in an apothecary jar. Try adding metallic chargers under you plates and doubling up on linens for added layers. Use seasonal items for inspiration! Staying within the color pallets of the season and layering neutrals creates a rich and delectable visual. Pumpkins and gourds are perfect for fall themed events and adding a bit of shimmer always brings in the Christmas spirit. Seasonal flowers, greenery from your garden and seasonal fruits and vegetables are a must! No need to spend a fortune, use what you have at home! Snag every candle you have around the house, use glassware for tea candles and place flowers in unexpected containers. Mix all styles of chairs and benches for seating, maybe adding pillows in those not so comfortable chairs. Think outside of the box! Use those old drapes in the hall closet as a tablecloth and hang Christmas lights over the table for perfect ambient lighting. Having an eclectic tablescape is a conversation piece and lends itself to an unpretentious yet intimate environment. From all of us at Barry Wooley Designs, we wish you a joyous and beautiful holiday season! Stay tuned in the coming weeks for more tips from our team to make your Thanksgiving and Christmas gatherings a dream come true. And remember, spread love and come together!